2 suggestions for clone skins. 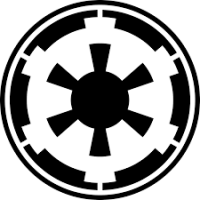 1) Battle hardened skins that are bases on troopers level. 1-25 being a shiny (looks new) 26-50 experienced (moderate wear to armor) 51-70 veteran (heavy wear to armor). You could choose of course which one you wanted but it wouldn't be unlocked till you reached those levels. 2) customizable helmets for clone troopers. Rewatching clone wars series made me notice how toopers customized they're gear to be different. I wish we could do the same. 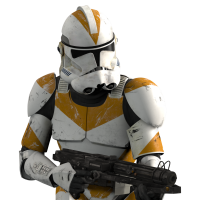 Perhaps have some "stickers" we could put on our gear to make our clone unique. Yes, I don't think this is gonna happen ? Not to say the ideas are bad, but if you think about it logically, is this what they could best spend their time and money on? Is this worth the testing and investment? Will everyone like this? I wont, the coherence is already gone since there is 3 different clone skins walking around in every map. And to be honest I think they really dont develop this game as much anymore, only the new maps and such, shich was probably already on their agendas for a long time.. The custom helmets are not a bad idea at all, pretty cool actually. I doubt they will but I'm sure people would like it. The wear however is actually a very big change.. and I wouldnt even want that personally. The more I think about... This would be best in SWBFCW game... Where to keep unified feel division skins would be based on maps but allowing players to customise skins with the 2 suggestions above. Also squads would be by colors (red,blue,green,yellow) to add variety and because it would be cool. Love this game it's an ideal model for a stand alone era game. I'd like this. I always feel like the more customization options you have. The more the character is YOU. In the CW, yeah they were all the same. But very different and always seemed to have something different with their armor. But to me, not just the helmet. But chest plate, pauldrons, thigh guards, maybe have the options to add a backpack that boosts the time before your weapon overheats because you carry more "ammunition". Heck yes I agree on that! True but clones look the same, they have special units and training. It gives you the amazing immersion of a unified army when you're all the same. Makes you feel like just another number. It feels great, and realistic. I think many people wouls agree with me which is why " IF" they're gonna do customizations, they should keep it aimed towards realism. So instead of just different legions, what about custom helmet paints for each map in their own default skin colors. Idc what it is as long as they keep it coherent. ^^^I created a post with that same concept in mind. I agree and am not in favor of the rainbow clone legions. Great minds thinks alike.